With Swipe we wanted to build something fun that made conversations more like running into friends in real life - wherever you are and whatever you're doing. When you get into the app, you'll see a stack of photos & videos posted by your friends. It's not stuff you'd find on Facebook - it's what they're really doing. That's because your username is invisible by default when you post to Swipe. You can do three things with posts, and they all involve swiping ;). If the post doesn't interest you, swipe left to pass - you'll never see it again. If you think it's cool, swipe right to let the poster know you like it. And if you want to reply, just tap the post, write a message, and swipe up. When your friend gets the reply, they can send one back to you. Replies can go back and forth until someone gets bored - and just swipes it away. That's it! Enjoy. @mfroushdy Hey Marwan, Just downloaded the app. Have a couple of queries . Whats the best way to reach you - email ? Hey @kwdinc. If you have questions about Swipe you can ask me here! @rrhoover @mfroushdy The onboarding and the invite flow feels really natural. I'm a little confused by the installation model — I was asked by my phone whether I was willing to trust an "untrusted developer." I can tell this isn't working through the app store, so how does the app "install" on my phone? @mlchild yep it's because we are using enterprise distribution for now. This is a prelaunch version exclusive for product hunt. We should be up on the appstore soon. Been enjoying Swipe quite a bit. 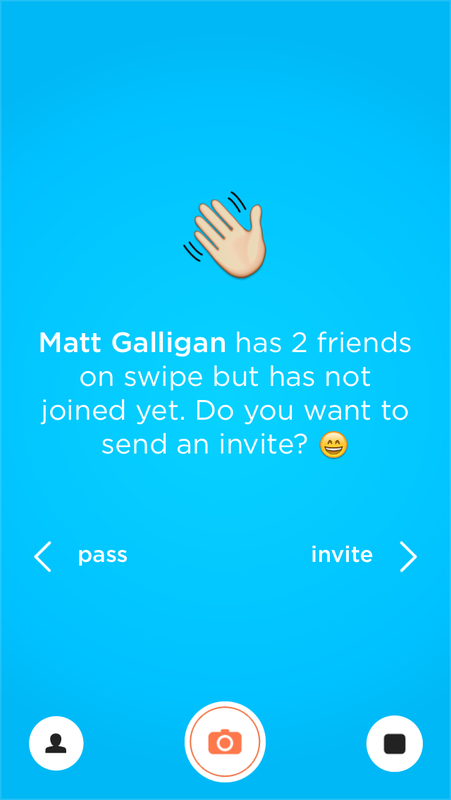 Super simple UX that's a bit like Snapchat but even easier, as you don't pick a contact to send your shots to. It feels as lightweight as @kevinrose's Tiiny but the larger pics are more immersive. @mfroushdy the app is slick and well designed. I remember you guys doing tagged and was on the beta for some time. What worked and didn't work in that app that you've decided to bring into Swipe? Was it a bigger opportunity with Swipe? @shane_112 yep it's because we are using enterprise distribution for now. This is a prelaunch version exclusive for product hunt. We should be up on the appstore soon. @mfroushdy Yo, sorry think you answered @mlchild. Mine was the tagthis vs swipe choice. Liked both, what'd you learn from the former that brought you to the latter? @shane_112 sorry about that! Things move pretty fast in this space. It took us about 8 months to build Tag, and by the time we were ready for release, it just wasn't as cool as other apps in the same field. Swipe is definitely more simple and fun to play with. We also reused a lot of stuff we built for Tag to build Swipe. so we were able to build this in a couple of months.